M 101 is a beautiful example of a grand design spiral galaxy, thus warranting its name as the Pinwheel Galaxy. Its arms are distorted due to tidal forces from interaction with companion galaxies. This, in turn, created many H II regions in which star formation is taking place. 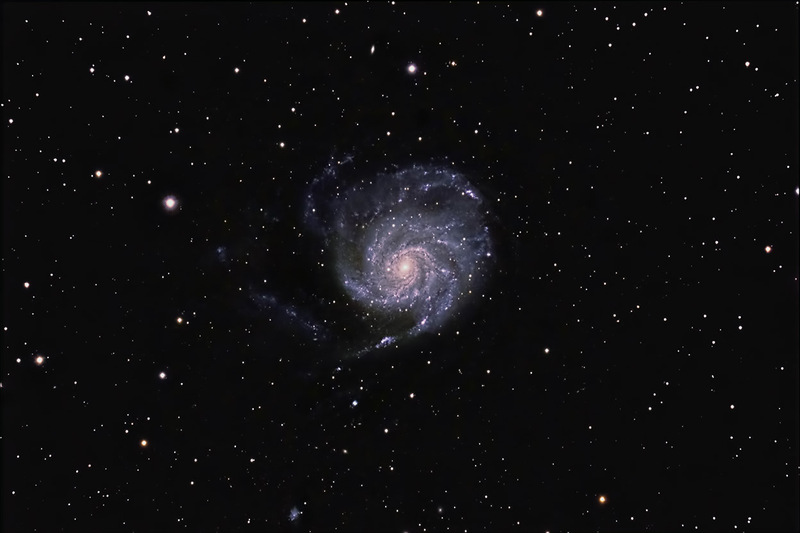 M 101 is approximately 25 million light years away in the constellation of Ursa Major. It is about 70% larger than our Milky Way (175,000 light years in diameter) and contains approximately 100 billion solar masses. It was first discovered by Pierre Mechain in 1781. Charles Messier then included this galaxy in his catalogue. Exposures: 22 @ 7.5 min. Processing: Images were focused using a Bahtinov mask and the camera's live-view. They were converted in Camera Raw before being aligned and combined in ImagesPlus. The composite image was adjusted in Photoshop CS6. Finally, sharpening and noise reduction was done using Topaz Detail and DeNoise respectively.